RapidPro recently worked with Megafun and Krome Studios to build the characters for their “TY the Tasmanian Tiger zoetrope”, currently on display at Australian Centre for the Moving Image at Federation Square, Melbourne, Victoria. 3D CAD drawings of each of the characters were supplied to RapidPro; however, several prototyping materials were tested to see which material would suit the sculptures requirements for colour and strength. After several trials, plaster was selected and instead of printing each character in monocolour, they were printed in full technicolour. Some design modifications of each character were necessary for strength and durability, as well as colour modifications to ensure vibrancy. 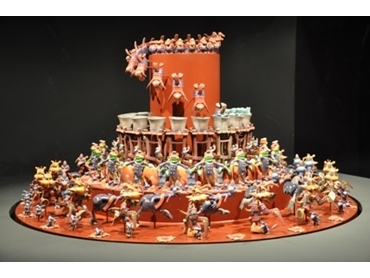 RapidPro worked with John Aitchison from Krome Studios to ensure that the zoetrope was as colourful and exciting as their preliminary sketches. Traditional methods for infiltrating and strengthening plaster prototypes were not acceptable due to the intricacy of the characters, so RapidPro devised a new prototyping method to ensure the parts were strong and the finish flawless. Rapid prototypes were used as models to show a product or part, also with the ability to be used for testing (form, fit, function), or as a functioning part or prototype. Each process uses specialised materials to ensure specific properties and finishes. Depending on the desired end use of the rapid prototype, the time frame allowed and budget, the team at RapidPro work with the client to ensure that needs are met using the most efficient rapid prototyping method.